SUTTON -- Two groups of descendants of a Central Massachusetts Indian tribe yesterday lost their bids for federal recognition as tribes, potentially delaying for years -- if not ending altogether -- their hopes of opening a casino. "We are extremely disappointed by the news, but it doesn't change who we are," said Frances Richardson Garnett, acting chairwoman of the Nipmuc Nation, a Sutton-based group of about 550. "We're confident we will have this decision turned around." Chief Walter Vickers, 67, who has pursued tribal recognition for 25 years, said he would continue to do so "as long the good Lord lets me." "We know who we are and we are going to be Native American forever," said Vickers, standing among a downcast group of Nipmuc members at their office in Sutton. "It doesn't end with a decision from the federal government." Officials with the Nipmuc Nation and the other group of descendants, the Nipmuck Council of Chaubunagungamaug, based in Dudley, said they have not decided if they will challenge yesterday's decision by the federal Bureau of Indian Affairs. But the initial response by members of each group suggested they may continue to seek federal recognition. Appeals go first to the Interior Board of Indian Appeals. Rulings by that administrative board can be appealed in federal court -- a time-consuming and expensive process, according to those familiar with the procedures. "Having to prove that we are who we know we are is a humbling process . . . we are committed to fighting for what we know is ours," Bert Rainmaker Heath, chairman of the Nipmuck Council, said in a statement. He said the group of about 350 was "extremely disappointed." The two groups, which split in 1996 into separate petitioners for federal recognition, anxiously awaited yesterday's telephone calls from Aurene Martin, head of the Bureau of Indian Affairs, which is part of the US Interior Department. The bureau rejected both groups after finding they failed to show they have existed as identifiable and continuous tribal communities and political authorities, as required under the established criteria. Federal recognition makes tribes eligible for federal education, housing, and health assistance programs. Recognition also clears the way for tribes to operate casinos, such as Foxwoods and Mohegan Sun in Connecticut, which are operated by the Mashantucket Pequot and Mohegan tribes, respectively. Those casinos gross more than $2 billion annually. The Narragansett tribe in Rhode Island is proposing a casino in West Warwick in partnership with Harrah's Entertainment. In late 2000 after years of analysis, historians, anthropologists, and genealogists with the Bureau of Indian Affairs recommended against federal tribal recognition of the Nipmuc and Nipmuck groups. But with only hours remaining in the Clinton administration in January 2001, Michael Anderson, who was then the acting head of the Bureau of Indian Affairs, reversed the staff's recommendation and granted preliminary recognition to the Nipmuc Nation, but not the Nipmuck band. In September 2001, Bush administration officials overturned Anderson's preliminary recognition, citing procedural improprieties, and issued a preliminary decision denying recognition. Since then, the Nipmuc have assembled additional documentation and gathered the endorsement of more than 50 politicians in Washington and on Beacon Hill. Those efforts were assisted by Lakes Entertainment of Minneapolis, one of the country's most successful gambling companies, which paid millions of dollars in upfront costs in the hopes of becoming a partner with the tribe in a full-scale casino on land owned by the Nipmuc in Worcester County or across the border in Connecticut. 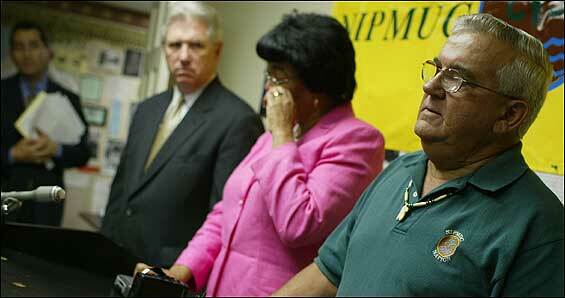 "We're shell-shocked," Guy Conrad, a longtime adviser to the Nipmuc Nation, said yesterday. "We'll get a fuller text of the decision by Monday, and then we will regroup and decide whether to appeal." Recognition of the Nipmuc was opposed in voluminous legal filings by Connecticut Attorney General Richard Blumenthal, who has testified before Congress that he thought the tribal recognition process is politically driven and heavily financed by private casino interests. "This final decision is a milestone victory," Blumenthal said in a statement. "The recognition process needs fundamental and far-reaching reform. Money and lobbyists continue to attempt to distort and improperly influence recognition decisions." In 2001, the Bureau of Indian Affairs recognized the Eastern Pequot tribe in Derby over Blumenthal's objection, and a year later, the bureau recognized the Schaghticoke tribe in Kent, again over his opposition. Blumenthal is appealing both decisions. Yesterday's decision was the second denial issued by the bureau in less than a week. On Monday, the agency rejected the Golden Hill Paugassetts, based in Colchester, Conn.
John Filchak, executive director of the Northeastern Connecticut Council of Governments, which represents 11 municipalities in northern Connecticut, joined Blumenthal in opposing recognition for the Nipmuc. He said it was a casino, not the Nipmuc, he opposed. Casinos create low-wage jobs while driving up local education and public safety costs, and diminishing the quality of life due to increased traffic, Filchak said. "Plus, there is the human cost to people going out and mortgaging the house to gambling," he said. "This decision deals a serious blow to proponents of casino gambling in Massachusetts," said Carey M. Theil, an opponent of gambling expansion in Massachusetts and board member of the National Coalition Against Gambling Expansion. Massachusetts has one federally recognized tribe, the Wampanoag of Aquinnah, which has proposed a casino in Southeastern Massachusetts. Another group, the Wampanoag of Mashpee, is awaiting a decision on recognition and is near the top of the list of applicants being considered by the Bureau of Indian Affairs. Globe correspondent Katie Nelson contributed to this story.